C'est moi, Grenouille, the "frog" authentique. This is a painting Etienne kept for months on his table. It is not a portait - I am not the subject. For one thing I am not "green," though it is a color tres charmant. For another, my hands and feet are tres chic. Whereas these - ils sont ridicules. It was très drôle to see such a large grenouille caught in the moment of leap. But at last Etienne has finished it and it has vanished within the large portfolio that swallows all of the paintings, including a small portait of moi. Now he is painting a dryad naïf with hair and fingers of boughs of cerise. The blossoms. Her figure shows the influence of Etienne's time before the models. The dryad has closed her eyes to her own beauty, or to miss the chance of flying petals. Perhaps he should have spent more time before "frogs." This compatriote shows not all of his "bone hints" as Etienne says. I was no service to him as I have not one bone, being made of céramique. I am more firm than bone, oui? I am stone. So unlike the word beneath the feet in this painting, which is more like sponge, soft from the pond. While the size of this "frog" is fantastique (the painting is a square of 48 centimetres - 19 of your pittoresque inches) the way it is holding the hands is not bizarre. Etienne did his "work of the home" prior to lifting the pencil, et oui, that is what happens to the hands of some grenouilles when we leap. Perhaps to make us more aérodynamique? 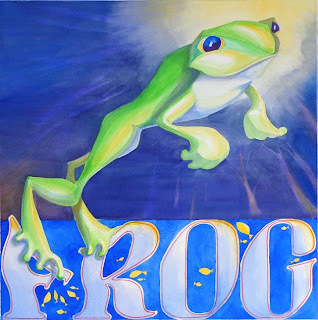 Grenouille did not mention that this painting was on my table so long because I was stuck. The background was what held me up - and I'm not really happy with it now, either, but the die is cast. And I would also caution that my new camera, used these last few posts, leans towads blue. The background is more violet than this shows. Green and purple are not everyone's "cup of tea." Maybe I'll revisit this idea in another drawing or painting. C'est un portrait très charmant d'une grenouille sautant. Vous devez être bien heureux de compétences d'Etienne. No, I haven't had to opportunity to practice my very out of date French but the google translate version looks okay to me. That is the thing with watercolor in that once you've made a decision you're committed to follow it through. Nevertheless, I do like it as it is - especially the first two letters getting squished by his powerful jump. i love that big back webbed foot squishing down... like he's getting a good leap going. i like him but he looks a little distressed. still...he made me smile. time for me to be offline. goodnight. He looks Super Hero ish to me. I think it's the chiseled jaw and the lighting behind the head. SuperFrog! As far as the new camera tending toward blue... one word... Photoshop (or its lesser priced cousin Lightroom) or Zoner Photo Studio, or such. PS. The squished F and R is quite cool.